In this comprehensive review, you’ll find everything you need to know about the device. 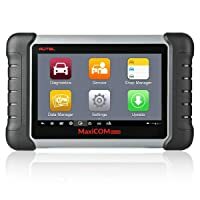 Autel MaxiSYS MS906 is a perfect device for doing significant vehicle repair and maintenance works. 4 Who Is Autel Ms906 For? Autel MaxiSYS MS906 is a more improved version of the highly acclaimed MaxiDAS DS808 and DS708. Compared to its predecessor, the MS906 has a broader range of features. They include diagnosis, service and repair functions, key coding, Wi-Fi connectivity, touch screen, sleek tablet-like design and so much more. So let’s get down to the main business, shall we? The Autel MaxiSYS MS906 is neatly packed in a black carrying case. 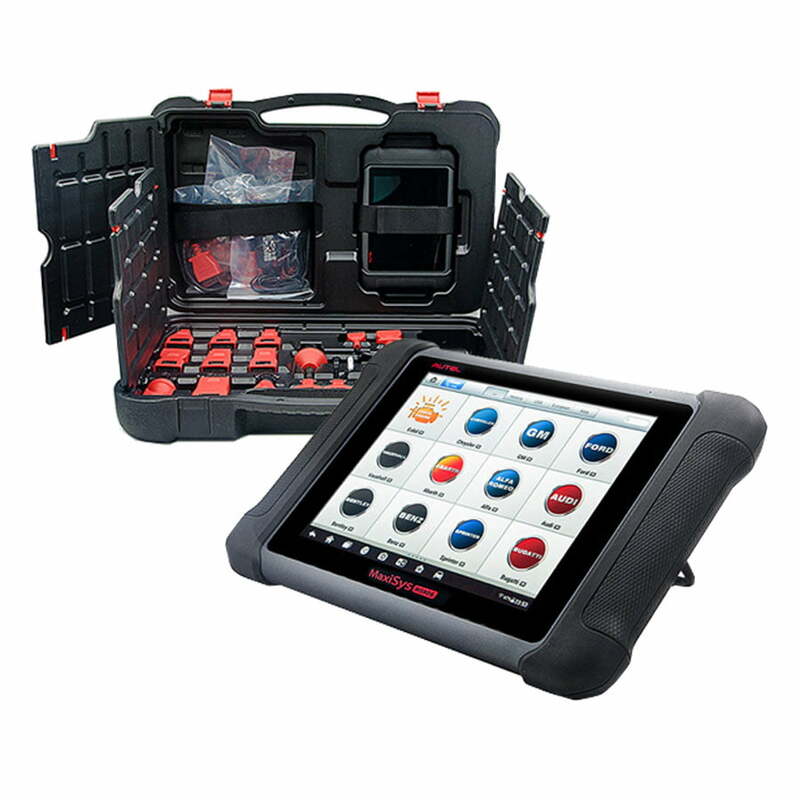 Apart from housing the scan tool, the heavy duty plastic case holds the OBD2 main cable, user manuals, and manufacturer-specific adapters. Optional adapters that you can include in the purchase are Benz-14, Fiat-3, and PSA-2. The scanner itself is held in place using a Velcro strap. That protects it from damage, not only during shipping but also in your day to day use of the device. Based on an Android operating system, the Autel MaxiSYS MS906 uses a Samsung Exynos 5260 6-core processor. It’s actually designed like a tablet, so it makes total sense that Autel decided to use Android OS. The OS and processor account for the scanner’s super-fast diagnostic speeds. First things first, the Autel MaxiSYS MS906 covers over 80 vehicle brands. The list includes all mainstream makes like Chrysler (the US only), Benz, BMW, Audi, Ford, Chevrolet etc. Although it’s primarily an OBD2 scanner, the MS906 does support OBD1 diagnosis. That is why the package comes with full OBD1 adapters. Basically, it supports full OBD1 and OBD2 protocols. What that means is that you can use this scan tool on virtually any vehicle manufactured between 1982 and now. Autel Maxisys MS906 supports full OBD1 and OBD2 protocols. Still, on compatibility, the Autel MaxiSYS MS906 works with Windows computers. 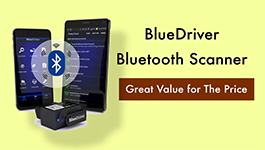 You can connect it to a PC via USB, download and analyze diagnostic reports. It’s this kind of convenience that makes the scanner a favorite for many professionals and DIYers. 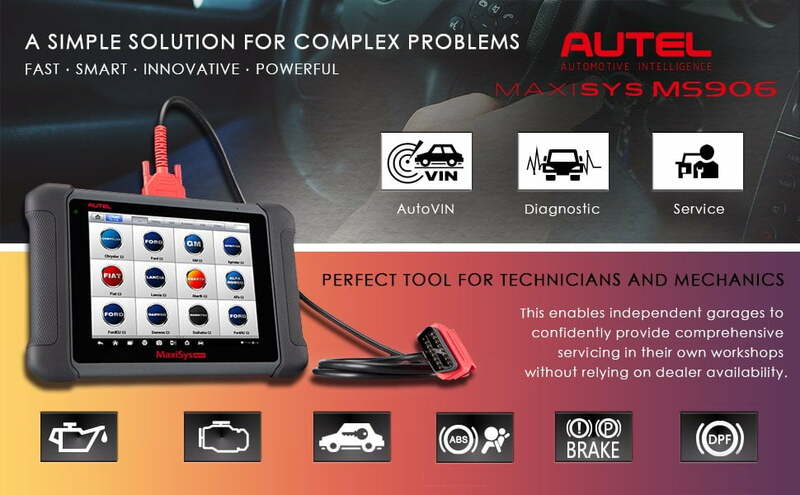 Well, now you know the hardware and software parts of the Autel MaxiSYS MS906 and you also know the range of vehicles that it covers. But how do you go about using it? Of course, the first thing is connecting the device to your vehicle’s OBD port using an adapter cable. 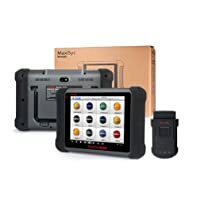 Contrary to beginner scan tools, the Autel MaxiSYS MS906 will not start automatically after the connection. You have to power it up by pressing the power button. The display will come on and after a few seconds, you’ll be able to see the home screen. There are 9 adapters nicely clipped in the case’s lid. Navigating the Autel MaxiSYS MS906 is pretty simple thanks to the 8-inch LED touch screen and an intuitive interface. With a resolution of 1024 x 768P, the display boasts of crisp clarity. It’s definitely one of the clearest available in the market today. More importantly, the scanner features a one-touch navigation menu that leads to all the supported functions. Once you choose a function, it will literally walk you through the whole process. For example, if you want to diagnose the engine light simply select the “EOBD” option. It will take you through the steps of reading engine codes of the vehicle you’re diagnosing. Additionally, there’s a MaxiFix tab whose function is to give repair recommendations. With this device, there’s practically nothing you can’t do. But you may want to go over the user manual just to get a hang of all the functions. Its 104 pages long but totally worth a read. Autel Maxisys MS906 is a simple solution for complex problems. 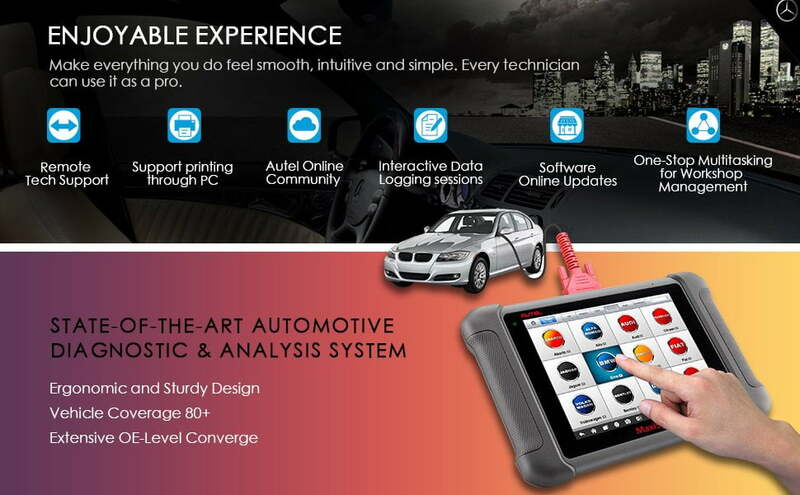 This Autel scanner performs full OBD2 functions. Read and clear OE-level codes for all the available vehicle systems. That includes engine, ABS, transmission, instrument panel, SRS and more. Provides live data. Besides offering real-time diagnostic feedback, live data also helps when you need to turn off warning lights. Supports actuation tests, adaptation, and matching. For instance, you can use it to program the ECU, tire pressure monitor and keys. Reset oil service, EPB, SRS, ABS, SAS, and TPMS relearn. 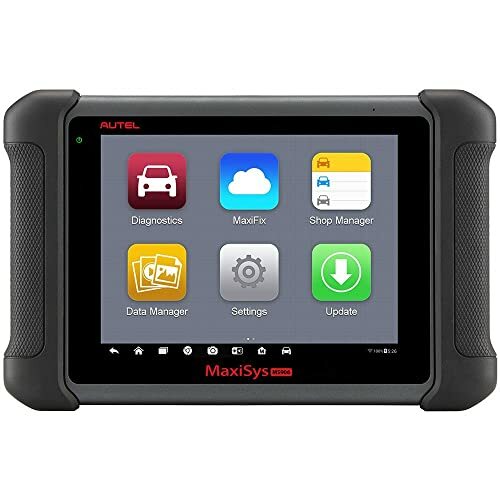 Although the Autel MaxiSYS MS906 is primarily an OBD2 scan tool, it also supports full OBD1 diagnostics. But you will need the OBD1 adapter for the vehicle in question. One of the best features of the Autel MaxiSYS MS906 is its ability to identify a vehicle with one touch. This AutoVIN function detects a vehicle’s VIN number from the ECU then records and stores it. If the AutoVIN feature fails (which is almost never) you can still enter the vehicle’s details manually. The scanner has a built-in Wi-Fi module. Besides downloading software updates, the Wi-Fi also allows you to go online. While there you can access tons of helpful diagnostic and repair resources. In case you run into any issues you can also contact Autel through the online platform. In addition to Wi-Fi, the Autel MaxiSYS MS906 also supports USB connection. You can connect it to a PC very simply using a USB cable. As mentioned already, the Autel MaxiSYS MS906 is fitted with 8-inch LED touch display. You can view data directly from that screen. If you don’t fancy that you can print it out on paper via a USB connection to PC. All diagnostic data remains stored in the scanner’s 32GB internal memory. You can retrieve it any time. But there’s an option for manually deleting data that you don’t need anymore. If you just want to delete data so as to create some storage space you could consider transferring it to a PC instead. At the back of the Autel MaxiSYS MS906 is an 8MP camera that has a flashlight. It is meant to help you take pictures whenever you need to. Since the device is Wi-Fi enabled, you can share the pictures online with technicians and other experts or DIYers. They may help with whatever problem you are facing. The Autel MaxiSYS MS906 is not just made to get the job done, it is also designed to withstand rough and tough use. The outer surface features a heavy-duty plastic encasing. And while it can survive a heavy fall, you obviously need to treat it with care. Inside the scanner is a 5000mAh lithium-polymer battery that provides up to 4.5 hours of continuous use. You don’t need to have it plugged into the car’s cigarette when using it. Consequently, you won’t have to worry about the possibility of the Autel MaxiSYS MS906 draining your car battery. Autel Maxisys MS906 give you an enjoyable experience. The total size of the scanner is 10 x 1.4 x 6.9 inches. Its weight is 22 pounds. That’s a perfect size for portability as well as storage. Overall, it is a well-constructed device that looks like a tablet in so many ways. 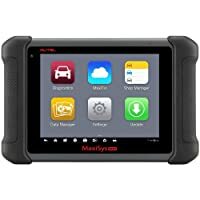 Whether it is the sleek look, fast data processing or exceptional diagnostic performance, it’s a guarantee that there’s at least one thing that will pick your interest the moment you try out the Autel MaxiSYS MS906. Uses Android OS which has a reputation for fast speed and excellent multitasking. The camera makes it easy to capture parts and share. Easy to use for anyone who knows how to operate a smartphone or tablet. One reason why the Autel MaxiSYS MS906 is a favorite for many technicians and DIYers is that it balances functionality and design almost perfectly. One-stop multitasking for shop management. Offers Full-system diagnosis and full-OBDII modes. Possible car compatibility problem. Not support ECU Coding. Possible vehicles Communication issue. Bottom Line Autel MS906 is the perfect diagnostic tool for technicians and mechanics. Autel MK808 is an excellent diagnostic tool for mechanics and experienced enthusiasts who doesn't really need OE-level functions such as ECU Coding, Actuation Test, or Adaptation.. Autel MS906BT is the perfect diagnostic tool for technicians and mechanics who want to do advanced ECU Coding. The MaxiSYS MS906 is the perfect compromise for the other two Autel scanners. It offers almost the same professional functions as the MaxiSYS MS906BT with the only exception of VCI connection and support for an oscilloscope. Even with that high-grade functionality, it only doubles the MaxiCOM MK808’s price. The latter just falls short because it lacks OBD1 support and has no camera, Wi-Fi, and other extra features. That makes the MaxiSYS MS906 the most practical of the three, especially for a professional technician or DIY person. Who Is Autel Ms906 For? So who is the Autel MaxiSYS MS906 built for? I’ve already hinted at that – it is perfect for professional and DIY auto mechanics. If you own or run a small to medium-sized shop you may want to add this device to your list of scanners. There are several reasons for that. First, it is a great performer when it comes to diagnostics. Secondly, it covers a wide variety of vehicles, including OBD1 and OBD2 models. Thirdly, it is tailored for professional work. The rugged construction, combined with the 32GB memory that stores vehicle data, makes it perfect for mechanical work. And while looks may not count for much, it is, in fact, an eye-catchy device. 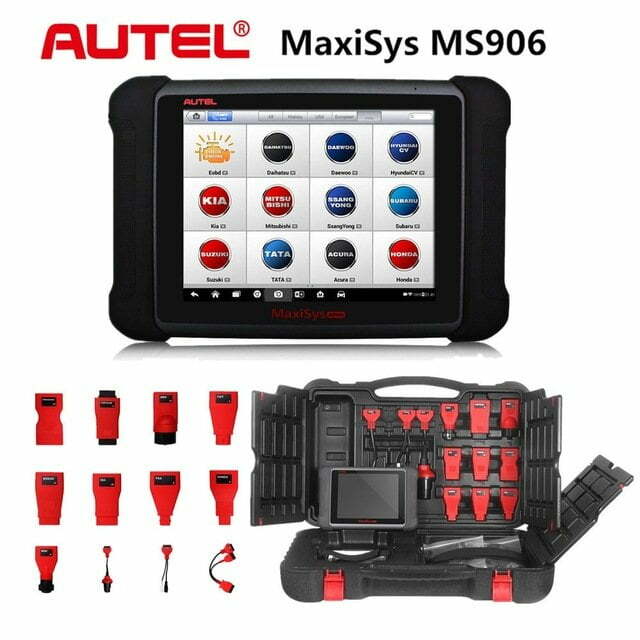 In sum, the Autel MaxiSYS MS906 is a perfect device for doing significant vehicle repair and maintenance works. It has an outstanding ability to probe onboard systems. And the included camera makes the whole process more fun. Equally important is the affordable price tag of the scanner despite the strong Autel brand behind it. So if you’re looking for an OBD scanner you may want to consider this one. You are a DIY-er and you are looking for an effective code reader? Autel AutoLink AL329 is one of the best choice for you. Check out the review now! The good news is that we have picked the 10 best timing lights that will effectively help you to set the ignition timing on your car. Let’s check out the review now.